My mom hates all my beanies hahaha and she also thinks I'm crazy when I wear them in the summer!! But I personally don't put on a beanie, even in the winter, to keep my head warm because 1. I have a lot of hair to keep my head warm, and 2. I never pull the beanie down low enough to actually keep heat in. I almost wore my spiked headband as a necklace today but then I decided to try it around my beanie for fun and it actually looked quite cool! 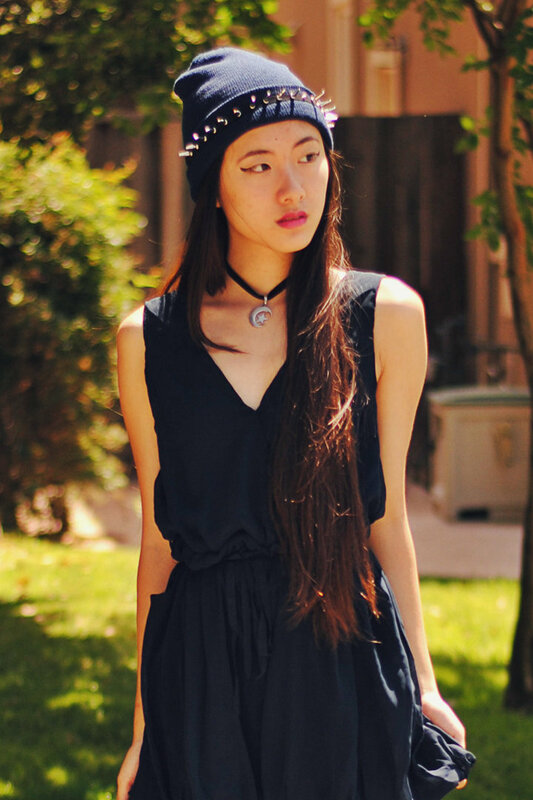 Plus the headband stops my beanie from falling off my head which is another plus :) The chiffon romper is from AX Paris; as you can see, I am taking a break from wearing all-black! I've never owned a romper before but this one looks more like a dress which is why I chose it! It's nice not to worry about unfortunate gusts of wind or having to constantly re-adjust a dress if it's on the shorter side. The neckline of this romper is actually a deep-V but I used a safety pin to keep the neckline more modest. love the spiked headband across the beanie. not sure i champion the beanie-in-summer movement either, but it looks great here! it looks so cool, the combination of the romper and the headband is great! gorgeous! and so proud of you, again, for being blogger of the week! that was such a good idea to put your headband around your beanie before reading what you wrote I almost complimented you on putting spikes on the beanie, because I've been meaning to do that myself! seriously for being so young you have such a stunning gift for fashion. I was looking at your lookbook and the pieces you made yourself are awesome.